Dalian, a city in the north-east of China, lies on the southern tip of the Liaoning peninsula and faces Korea across the yellow sea. It has passable beaches, a large shipbuilding industry and a lot of impressive skyscrapers. From the top of any of these scrapers you can see out across the ocean and in the other direction the pleasant green hills which mark the end of the urban sprawl in the North. The city was administered by the Russians until the Russo-Japanese war of 1905. In 1945 the Russians again took up its administration for a short period. In the eighties it became a glowing example of the new China, and a bit of a showpiece for the CCP. The tallest and most beautiful building in Dalian ‘The Victory Mansion’ was frequently used in TV programs boasting about the construction boom. The building itself I found to be completely empty: an unfurnished husk. Work on it had stopped just short of completion due to the Asian crisis of 97. I wanted to look inside, but as I approached past a huge hoarding of Comrade Deng, I was prevented from entering through the main gate by a rather apologetic guard. I could not see anything of the lobby across the lush green lawn of the buildings grounds, which might as well have been a mote, keeping The People out from the inside of this Stupa to the dream. 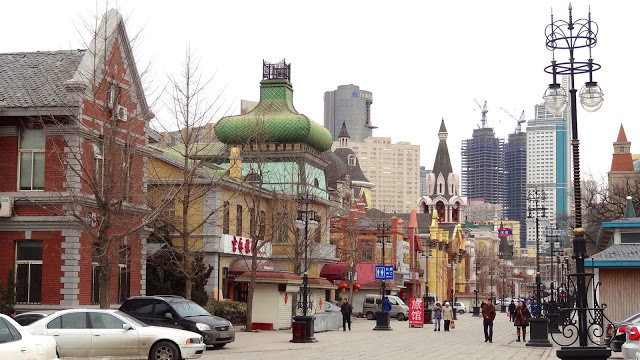 My hotel in Dalian was on Russian street. It was a touristy sort of place, but it made a change from bland apartment blocks and shopping malls. Russian Street is (or was at least, I have no idea whether it has been left standing) a mixture of recently erected copies of Tsarist era buildings, and somewhat away from the limelight toward the back end of the street, a few sturdy originals. The copies have not been built with good quality materials, giving the street a certain look, ‘cheap’ comes to mind. The street is around four hundred meters long, ending in a defunct fountain and beginning with a bridge over a small stream. Being for pedestrians only, it is a pleasant enough place to wander down and stop off to have a beer, eat a few chicken’s feet or meat skewers at one of the many street-side BBQs. The locals like going down there to practice calligraphy, using water on the light colored paving stones; and if they you are lucky, you may see a Russian tourist down from Vladivostok or some other town of Eastern Russia. I sat on a rickety plastic stool at a street-side BBQ out on Russian Street and enjoyed some spicy lamb skewers. On paying the bill and getting up to leave I was quite surprised to hear the Chinese Muslim cooking the skewers yell out “Merry Christmas”. It was early September. He looked quite pleased with himself, and though I could not quite bring myself to say Merry Christmas back, I smiled at him. I headed for a bar in the centre of the city. I had to walk several blocks from Russian street to catch a tram, far enough for me to pick up a couple of cans of beer from a street kiosk. The tram stop was on a wide breezy avenue close to the harbor, dominated by the imposing Hilton hotel. The hotel was a thirty-storey cylinder, dwarfing the various restaurants and karaokes, with gaudy neon signs, on its flanks. The tram was pleasantly clean and tidy; its wooden interior, well maintained by the female driver and her assistant. It was decked out with red cloth banners bearing characters wishing the commuter a peaceful path to making a fortune. A place with ambiance in the public domain; a rarity, one has to say, in the Chinese city. The bar was on one of the roads which spoked out from the square where we got off. ZhongShan Square, which is actually a large roundabout, was filled with the ancient practicing ballroom dancing to music booming out with plenty of static from elderly speakers. On this temperate evening others were taking in their dose of economic glory from the huge TV screen suspended in the darkness above the concrete plaza. The subterranean bar, I descended into, was already full of smoke and revelers. Beers, the formaldehyde content unknown to me until the next morning, were cheap. When I got back the gates to the hotel were closed, but not yet locked, the iron was sticky to my touch, a recent paint job – a spot came off on my fingers. Even from the dim light of the guard box, I could see about half the paint had ended up on the concrete rather than the gates – a shoddy job. The next morning I was awoken by a jackhammer’ chorus already starting up. Out on the street blue uniformed women short in stature were sweeping away last nights waste with primitive brooms; grey uniformed elderly officials hopelessly tried to control pedestrians at a couple of large intersections I crossed. Their whistles and shouts were loud – but loud noise was nothing here. The Victory Mansion looked beautiful against the light grey sky. I was headed to the early morning fish market. I got off the bus in a neighbourhood featuring shops full of trinkets, dried foods and Hello Kitty backpacks. At the outskirts of the market, I took not a bad picture of an old guy hanging up a bunch of ducks. Looking at the picture now, it reminds me of a photo I’d seen in a magazine; white ducks hanging upside down, getting their throats cut, flapping wildly, and spraying blood on each other. I can hear a universal groan: just what we need another person who gets upset about killing animals! My picture of plucked dead ducks looks overexposed, an accurate shot of how bright that day was. Down the street past various crustaceans, clams, undecipherable fish bits and eels I came to the market proper. I stopped by a plastic container full of turtles. Where are they from? I asked the seller. Brazil, he said. I wondered if they were for pets or to eat - but the Chinese word for pet wouldn’t come to my brain. I made my way out the back of the market. Tattooed men were shovelling fish off trucks to the waiting fishmongers grasping square white plastic buckets below. The men on the trucks, standing in fish to their knees, revelled in being above the others, barking contemptuously at those who complained at what they weren’t being given the best fish. My camera battery failed at this stage, I badly wanted some pics of those tattooed guys. My cell phone camera just couldn’t do them justice. After seeing all that I went and got a burger for lunch - and, yes, felt guilty for not being more adventurous. In the afternoon I went up into the hills which surrounded Dalian, they were filled with rather kitsch surrealistic sculptures and freely growing hemp. It was a great escape from the crowds in the centre. I must say out of all the cities I’ve been to in mainland China Dalian rocked the most! Frank Beyer is from New Zealand and has spent five years in Asia, mostly in China and Indonesia. Despite the fact that Indonesian is easy to learn and Chinese hard, he’s come out of it all with good Mandarin and hopeless Bahasa Indonesia! Frank’s writing has appeared in Flash Frontier and Drunk Monkeys. He holds a degree in history from the University of Auckland. He loves to travel, and is very aware that any discomfort on the road will be fondly remembered after!